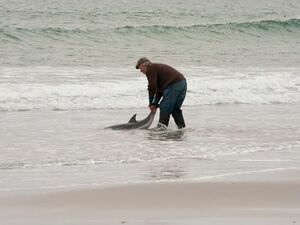 Hats off to this gentleman who saved this young dolphin on a beach near Belmullet [Co Mayo] on Saturday. 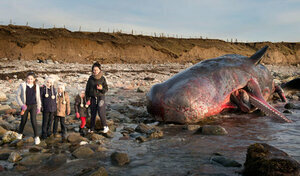 After several attempts he managed to coax the dolphin back to sea. Took this photo while photographing a wedding. Great man and well done. Posted in Misc and tagged dolphin, Mayo at 10:58 am on March 23, 2016 by Broadsheet. Fair play to him, a rare experience that he will treasure in his memory. Lucky he had the wellies with him!